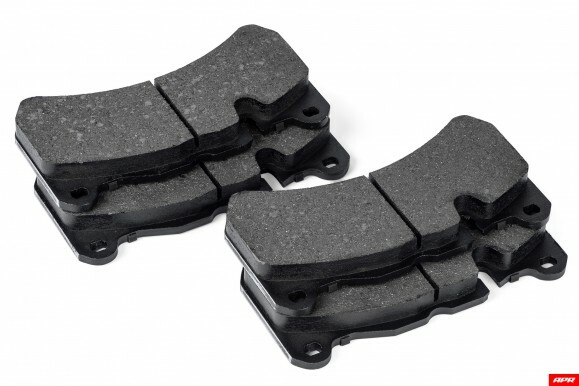 New Advanced APR Brake Pads for APR Big Brake Kits! Specifically designed for use on the street for daily driven vehicles. Suitable for the street, but more geared towards aggressive driving and entry level track days. For specific details on each pad, including optimal temperature ranges and pad characteristics, please visit our product page. VW®, Volkswagen®, Golf®, GTI®, R32®, Jetta®, Passat®, Passat CC®, Toureg®, Tiguan®, Beetle®, EOS®, A3®, S3®, A4®, S4®, RS4®, A5®, S5®, Q5®, A6®, S6®, RS6®, Q7®, TT®, A8®, S8®, R8®, Porsche®, 996®, 997®, 911®, Carrera®, Cayman®, Boxster®, Cayenne® are trademarks of Volkswagen AG, Audi AG, and Porsche AG. While we try to keep everything current, APR Motorsport Ltd is not responsible for errors in pricing on this web site. All prices are in GBP and are applicable to the United Kingdom only.